Beren and Lúthien mainly reminded me of why I never finished The Silmarillion. There is a paragraph late in the book that explains as well as any. Editor Christopher Tolkien is describing a misunderstanding that arose between his father and his father’s publisher after the apparently unexpected success of The Hobbit. Tolkien had sent the publisher several possible manuscripts for his second publication. What with one thing and another, they did not find a reader who knew what to do with the materials Tolkien had sent, and the publisher pressed for something else. 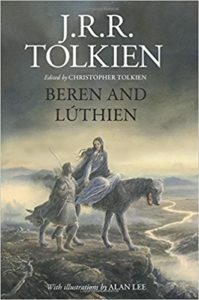 It’s not that Beren and Lúthien is a bad tale, it’s just that the prose versions in the book are in an ancient register that is so distancing as to render the story nearly bloodless, while the poetic versions are narrative poetry, using mostly modern English in an Anglo-Saxon verse form to tell a high romance from the distant past of an invented world. If this weren’t Tolkien, I never would have finished, and I dare say if it had been published in the 1930s or 1940s before The Lord of the Rings it would have sunk like a stone, leaving The Hobbit as a curious one-off by an obscure Oxford professor with a knack for invented languages. The foregoing is a bit unfair to Beren and Lúthien, which is interesting for a number of reasons. It’s interesting to see how the story changed over the decades that Tolkien worked on it, to consider what he kept, what he left out in subsequent versions, how this great love story was increasingly tied to the other legends of the First Age that he was developing over the same years. Some things never changed: Beren’s outsider background, Lúthien’s love for him over paternal objection, the quest for a Silmaril, her rescue of him, their joint return to peril, his loss of a hand, the hunt for the great wolf, her retrieval of him from beyond the veil of death. Other elements vary more. In an early, prose version, Beren is held in thrall to the lord of the cats, whereas in later versions he is captive to an early version of Sauron. Early on, Beren is also an Elf; later, he is mortal. Their fates after Beren returns from the dead also vary. Sometimes they live long lives among their peoples, sometimes they wander long but alone together, sometimes they fade quickly from the world. I found the early version the best for showing how the great love between Beren and Lúthien came to exist. In later ones, it is more or less assumed, or appears to be the natural result of her beauty and skill at dancing. The gradual approach in the first version has more heart, and also shows more of why she might fall for him. There is a scene in the verse version where two sorcerers are singing over one another, attempting to gain the upper hand with the power of their songs and verse. That vividly brought to mind the Kalevala, one of Tolkien’s key inspirations for all of his tales. (Although I have to admit that my knowledge of the Finnish national epic derives almost entirely from a children’s version.) Other scenes show how vividly Tolkien could write when he chose to flesh out an incident fully. That is another point that his son makes repeatedly: many of the stories of the First Age are given in compressed form, as parts of a very large body of legends and myths. If they are unsatisfying to me as a reader, as many of them are, that is because they are often mere summaries of tales that would be far longer if told in full. This reminds me that I should try to finish “The Children of Húrin”. I got bored and put it down, but I wonder if that wasn’t just the massive sleep deprivation from having a newborn talking. My notes here tell me that I read The Children of Húrin, but my memory does not hold much more than vague notions of elves and forests. I am glad that these books exist, I am glad that I own them, and reasonably glad that I have run my eyes across them, but I am no more likely to finish The Silmarillion now than when I was 12. I did finish The Silmarillion, at maybe sixteen or so. That was before cable TV.